D. One is a problem, and it is time for the industry to take notice. D has certainly gotten MVRemix's attention with his debut album, Dvisione. D.One showcases his lyrical dexterity and his ability to provide conceptual material on all levels with his latest release, making for an impressive debut album. The up and coming emcee has paid his dues in the underground and is now looking for that big break to launch his career. So pay attention, because D. One may be the next emcee to blow. MVRemix: Tell the people who D. One is and what you are all about? D. One: As far as music goes I listen to everything. From Pearl Jam to Elton John to Pun. Favorite rapper for the past few years gotta be AZ though. I’m all about making music, listening to music, chilling with my girl, watching movies, close circle of friends, ignoring most people, being broke and unemployed, playing ping-pong, promoting D.One , promoting Lace Payne, doing shows, silent moves, slangin' CD's, picking up Lace because he doesn’t have a car, wakeboarding, lifting weights, boxing, quitting office jobs, being late, typing online interviews , playing the back and waiting for my time man. MVRemix: Where were you born and raised? Do you still live there now? D. One: I was born in Winchester, MA. Lived in Billerica, MA for a few years then moved to Salem, NH. I’ve been living all around Boston for the past four years for school and I’m between spots now. I’m moving out to LA for a while once I get some doe together. MVRemix: What was D-One like as a child and a teenager? D. One: Man we’re getting right into it , okay – as a child I guess I was on the shy side but I always had mad friends and played sports all through high school. My dad was a boxer so I got into that as a teenager and I’m still doing it. Like I said I pretty much grew up in Salem, I love my town – everyone is pretty close and I kept a tight group of friends. It’s funny because when you tell people you’re from NH they get a whole different picture in their heads. Salem ain’t a hick town at all – you leave my driveway and go a mile down the street and you’re in Lawrence and in Boston in twenty-five minutes. D. One: I don’t think I really got into it until about 7th grade, so I guess I was like 12 or 13. I remember I had a few Pac singles but when I bought Ready to Die it had me. D. One: I started rhyming real late compared to most emcees. I was just a fan till about sophomore year of college; I was 20. I’m 24 now so I’ve made some serious moves in that time. I was in this unbelievably boring history class and me and this kid used to write freestyles back and forth in the back of the class. It was addicting to me and within a month I was spitting out wack raps daily. It really did come natural to me in a lot of ways, and I think one thing that really helped my flow is that I started recording right away. I recorded everything I wrote right from the start. That helped to sharpen my flow because if I didn’t get the verse right the first time I couldn’t punch in, I had to spit the whole joint over. Plus I listened to everything and learned what my weaknesses were. I know those tracks are gonna get leaked if something ever pops off. MVRemix: How did you first start to make a name for yourself in the streets and the underground circuit? D. One: My cousin worked at a studio back then and he let me record basically for free. I made a 12 track CD with some freestyles and writtens over beats that I downloaded. Not really industry beats this time, but not originals. The ones you can get off Napster when you search for instrumentals. But yeah I burned the CD's on my own computer and handed them out around town. This woke a lot of heads up to what I was doing and was the beginning of my loyal hometown following. MVRemix: In your bio it states you spilt with Absolute Proof. Was that the group you were in, or your partner? Explain why the split happened. 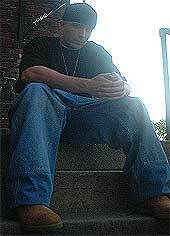 D. One: After the my first CD ( I was known as Static then) I formed a group with another emcee from the area; El*A*Kwents. We called ourselves Absolute Proof . This was around the time I really began to hone my skills and take the game seriously. Me and El were making a lot of good connections, we dropped a demo and a solid 12 track LP called “United States of Mind”. This was the first real album I had done; all original beats, singers, guitar players, tables. The album sold about 1,000 copies and we packed the Middle East in Cambridge, MA to capacity at our record release party. Which was crazy because we came out of nowhere. We had only done a few small shows before that. Unfortunately I felt we were going different directions with our music and I wanted to try the solo thing. MVRemix: How did you hook up with J.Greede, and why sign with him? D. One: Greede produced a couple Absolute Proof tracks, and we began talking during the recording of that album. He was starting a record label and wanted me to consider signing with him. I was involved in Absolute Proof so I didn’t think much of it at the time. He wasn’t the reason I left the group, but when I decided to leave I knew where I was going. We had some unbelievable talent on the label: female singer Paris Azelle, Dorchester rhyme vet Lace Payne , Evic and 14 year old Freshton Flav. It was a good opportunity for me to be performing and associated with that kind of talent; plus Greede was giving me free beats and paying for my studio time. "I’ve made some serious moves in that time. I was in this unbelievably boring history class and me and this kid used to write freestyles back and forth in the back of the class. It was addicting to me..."